The Military-Family: Needed the Wall of Support Lately? Needed the Wall of Support Lately? 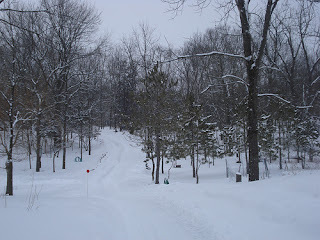 The secondary title of this blog is "Michigan Ski Run". Well, it may look like a snowed in driveway to some but to this military family it looked like an opportunity to have some fun! We always found new ways to have fun while traveling the globe! Last Saturday we had stacks of sledders on this hill driveway having a gut busting good time! With snow banks over two feet high this driveway reflects what many of us have been challenged by--the twists and slippery spots of life! The banks of snow give us a safety net to insure the trees don't become a "hard lesson" or an obstacle to having fun! The snow banks of support keep us "on track" and the fun keeps us going ahead while bouncing over those rough spots we all face! The PCS stressors; the longer than expected deployment/TDY; the impatient parent/child; the trip to the commissary (haha); decisions to be made and the need for a friendly face are all bumps we face together. Your support to a new neighbor/friend provides a wall to keep them on the track. I was so impressed with the quick responses in support of the "My Husband" blog on the 22nd of February! Yep, that is the military community at its best! Way to go! The military services and community provide many ways to help during the slippery spots of life but they can only help if you are willing to get on the sled or skis and head down the hill for some adventure! Visit those support centers, join the many groups around you that offer a new adventure, find a new friend, open the door to an old friend with a phone call or email and look ahead for those slippery spots so you can find a wall to help when you need it! How do you stay on track in your daily life and where do you find ways to support you and your family during the slick spots of life? Share your ideas with your military community! Humility certainly has a price tag!